This is the only formula of its kind in the world that is: Formulated without banned substances, Full Dosed, 100% Natural, Health Canada approved and 100% Free from artificial flavours, sweeteners (not even any sucralose) or artificial colours. 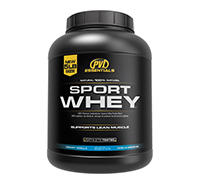 Iso Sport Whey uses a 25% higher whey protein isolate. Whey protein helps build and repair body tissues (like lean muscle) like never before. Rich in Glutamine & BCAAs as well as cysteine peptides. And still designed to taste phenomenal, with our Brand New high grade debittered stevia isolate – zero stevia aftertaste that will pleasantly surprise you.